It's ladder match overload time again as we take a look at WWE's latest pay-per-view offering, Money in the Bank, shown live in the early hours of this past Monday morning on Sky Box Office here in Britain. later, when Reigns himself was atop the ladder about to grab the case there was a familiar noise as the lights went out for a moment, signalling the entrance of Bray Wyatt into the proceedings as he promptly took Reigns off the ladder and took him down with sister Abigail. I guess we know who he's facing next month now! Before the match began the Miz came down to the ring, microphone in hand, to basically complain about how he'd been screwed out of the title. He then took a seat at the commentary table as, and this is probably the only time I've written about this in a Paul Wight match, Ryback dominated the Big Show and pushed him around the ring like a stuffed toy. The even bigger guy didn't dominate for long though, and we soon got another of those Joey Styles OMG moments when Ryback actually took Show down with a suplex. A few moments later the show spilled out to ringside once again after show connected with his knockout punch, and as the now-recovered Miz looked on, Show warned him to stay out of the way, or words to that effect, as he rolled Ryback back into the ring. Miz didn't take the advice though as he followed Show into the ring and clobbered him with his microphone. He then delivered the same shot to Ryback before heading for the hills as the referee called for the bell, giving Show the disqualification win but keeping the title on Ryback. This match had everything, great storytelling, tons of drama, excellent sequences throughout, and tremendous performances from two of the best in the business. It really was a knock down, drag out affair, a slobber knocker that you just couldn't take your eyes off. Owens looked like a true superstar, like he belonged in such lofty company, and in Cena he had the perfect opponent. The boy John may take a lot of stick, but he's more than capable of putting on an outstanding match with anyone he steps in the ring with. These guys threw everything they had at each other, and more. They each kicked out of pins after they were taken down with the heavy artillery, and each became more and more frustrated with their inability to put the other away, so much so that Cena spent a great deal of time arguing with the referee about disputed counts, and I don't think I've seen that since his heel days many years ago. Following an excellent video tribute to Dusty Rhodes it was on to the penultimate match of the evening as Darren Young & Titus O'Neil of the Prime Time Players challenged the New Day's Big E and Xavier Woods for the Tag Team titles. Well, compared to some of the tag title matches we've seen on recent pay per views this was somewhat of a tepid affair. Don't get me wrong, this was a good enough match, but it just wasn't in the same league as the New Day's matches with Tyson Kidd and Cesaro. The match began with Young taking the punching bag treatment as Biggie and Woods doubled up to good effect before Young managed to get the hot tag to O'Neil as the big man cleaned house. There was some nice work from Biggie and Young as some of the action spilled out to ringside before O'Neil took Woods down with a sit-down powerbomb for the title winning pin. It's a shame they weren't given five more minutes, because this could have been a hell of a lot better. 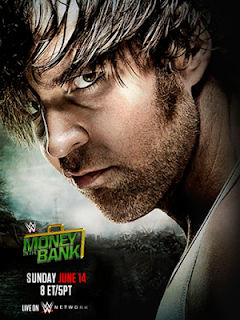 The main event saw Dean Ambrose challenging Seth Rollins for the WWE World title in the evening's second ladder match. It began as a normal wrestling match as they exchanged holds and moves in the ring, but when Rollins clobbered Ambrose's knee as he tried to climb a ladder it signalled a distinct change in mood as it were. Things were serious at that point, but got a whole lot more so from then on. You could say that the match took a more brutal turn from that point, because when Rollins wasn't working over Ambrose's bad wheel they were giving us the aforementioned OMG moments, such as when Rollins was dumped on a ladder perched between the ring and the commentary table. In between these moments they treated us to a very brief brawl through the crowd before returning to the ringside area. Perhaps the most brutal moments were when Rollins took Ambrose down with a series of powerbombs into the ringside barricades. He then delivered what he thought would be the final blow with a sit-down powerbomb onto a ladder strewn with steel chairs, but even this wasn't enough to keep the lunatic fringe from stopping Rollins from grabbing the belt. In conclusion - so what are my final thoughts on this year's Money in the Bank show. Well, if you haven't guessed by now we'll cut straight to the chase. This year's show was pretty darn good, filled with tremendous action from top to bottom, and although it would have been great if some matches had been given more time and the main event had been about five or ten minutes shorter overall this year's homage to the ladder match delivered big time. As for my prestigious match of the night no-prize do I really have to tell you who won? I'm going to anyway, because there's no doubt that John Cena and Kevin Owens stole the show, which reminds me that I must get round to watching Elimination Chamber sometime, or wait until it's released on DVD over here in Blighty. So with all of that out of the way there's just one more thing to do, and that's to give this show the big thumbs up.